Today is the the 92nd birthday of Robert Kennedy. His Indianapolis speech is one of the most important speeches of the 20th century. Give yourself a gift and celebrate his life today by reading or listening to it. The world is a better place because he was in it and still feels the loss that he has left. BEST KNOWN FOR: Robert Kennedy was Attorney General during his brother JFK’s administration. He later served as a U.S. Senator and was assassinated during his run for the presidency. Robert F. Kennedy’s speech on the assassination of Martin Luther King, Jr. was given on April 4, 1968, in Indianapolis, Indiana. Kennedy, the United States senator from New York, was campaigning to earn the 1968 Democratic presidential nomination when he learned of King’s assassination in Memphis, Tennessee. Earlier that day Kennedy had spoken at the University of Notre Dame in South Bend and at Ball State University in Muncie, Indiana. Before boarding a plane to attend campaign rallies in Indianapolis, Kennedy learned that King had been shot. When he arrived, Kennedy was informed that King had died. Despite fears of riots and concerns for his safety, Kennedy went ahead with plans to attend a rally at 17th and Broadway in the heart of Indianapolis’s African-American ghetto. That evening Kennedy addressed the crowd, many of whom had not heard about King’s assassination. 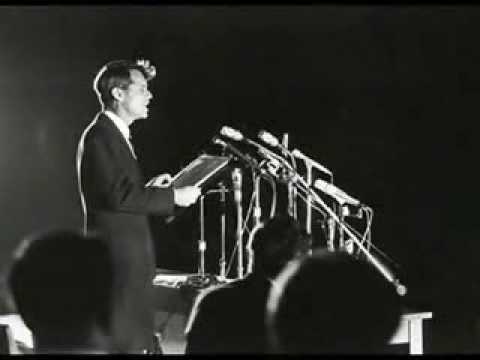 Instead of the rousing campaign speech they expected, Kennedy offered brief, impassioned remarks for peace that is considered to be one of the great public addresses of the modern era. Kennedy was the first to publicly inform the audience of King’s assassination, causing members of the audience to scream and wail in disbelief. Several of Kennedy’s aides were worried that the delivery of this information would result in a riot. Once the audience quieted down, Kennedy spoke of the threat of disillusion and divisiveness at King’s death and reminded the audience of King’s efforts to “replace that violence, that stain of bloodshed that has spread across our land, with an effort to understand with compassion and love.” Kennedy acknowledged that many in the audience would be filled with anger, especially since the assassin was believed to be a white man. He empathized with the audience by referring to the assassination of his brother, President John F. Kennedy, by a white man. The remarks surprised Kennedy aides, who had never heard him speak of his brother’s death in public. Quoting the ancient Greek playwright Aeschylus, whom he had discovered through his brother’s widow, Jacqueline Kennedy, Kennedy said, “Even in our sleep, pain which cannot forget falls drop by drop upon the heart until, in our own despair, against our will, comes wisdom through the awful grace of God.” Kennedy then delivered one of his most well-remembered remarks: “What we need in the United States is not division; what we need in the United States is not hatred; what we need in the United States is not violence or lawlessness, but love and wisdom, and compassion toward one another, and a feeling of justice towards those who still suffer within our country, whether they be white or whether they be black. To conclude, Kennedy reiterated his belief that the country needed and wanted unity between blacks and whites and encouraged the country to “dedicate ourselves to what the Greeks wrote so many years ago: to tame the savageness of man and to make gentle the life of this world.” He finished by asking the audience members to pray for “our country and our people.” Rather than exploding in anger at the tragic news of King’s death, the crowd dispersed quietly. Despite rioting in other major American cities, Indianapolis remained calm that night after Kennedy’s remarks, which is believed to have been in part because of the speech. In stark contrast to Indianapolis, riots erupted in more than one hundred U.S. cities including Chicago, New York City, Boston, Detroit, Oakland, Pittsburgh, and Baltimore, killing 35 and injuring more than 2,500. Across the country, approximately seventy thousand army and National Guard troops were called out to restore order. The speech itself has been listed as one of the greatest in American history, ranked 17th by communications scholars in a survey of 20th century American speeches. It was one of the fascinating times that one remembers. I was 19 years old in 1968 when Robert Kennedy was assassinated and it felt that the last hope for us all had died that night. As a young girl I was fascinated with President Kennedy, he was wonderful and there seemed to be so much hope, such a feeling of Hope. I followed Bobby Kennedy and all he did and it was so exciting that he would become the next President, until that shot. Its because of “Camelot” era and the hope of Bobby Kennedy I so wanted to go to America, I finally made it when I was 22 years. Two years ago I was booked to go to San Francisco, my dream, but ill health has prevented me. I hope to make it though. Bobby Kennedy will always be 43. So much has been written about him good and bad, like President Kennedy but in the 1960s when they were alive there was a Future a good future a peaceful future for us all. Great blog as ever. Shall reblog this is so interesting. Wonderful blog, a time when there was a future a better future and hope for us all.